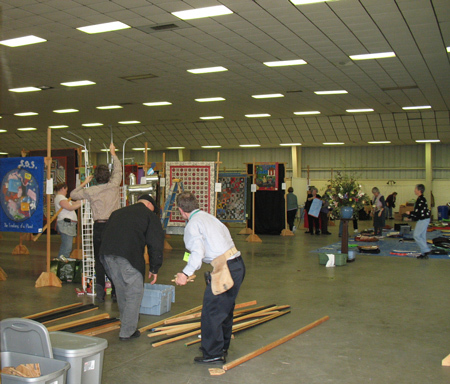 With no closing ceremony, the quilt show melts away for another year. 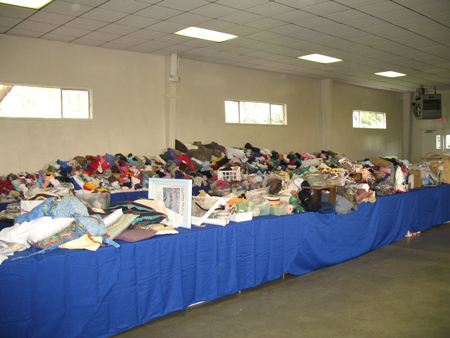 They came, they bagged their bargains, they left almost nothing behind. 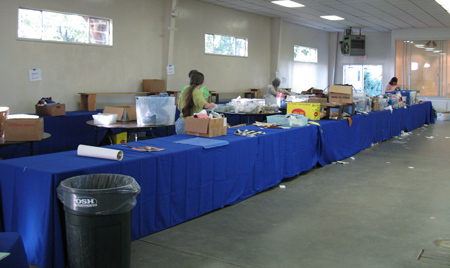 Clean tarps to lay the quilts on. 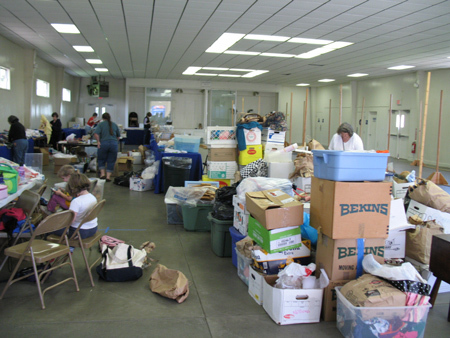 Hard work going on by dedicated guild members, their kith, and their kin. The line for quilt pickup. Within an hour the building is clear. 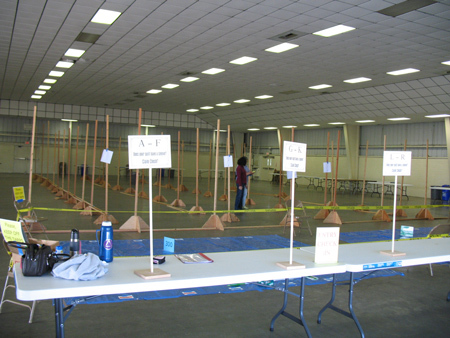 …and the work on next year’s show starts… tomorrow. That's a lot of bargains. 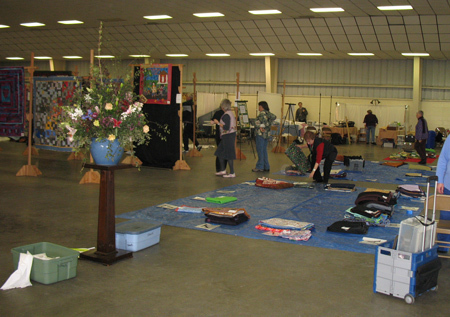 Auction quilts and vendors at the ready. 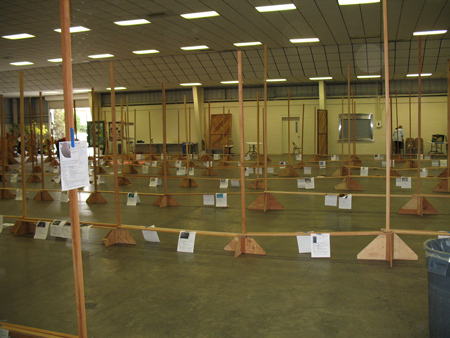 The show, beautifully hung and decorated. 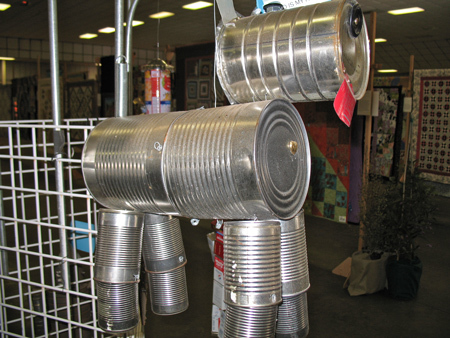 Of course I had to zoom in on the tin can dog. 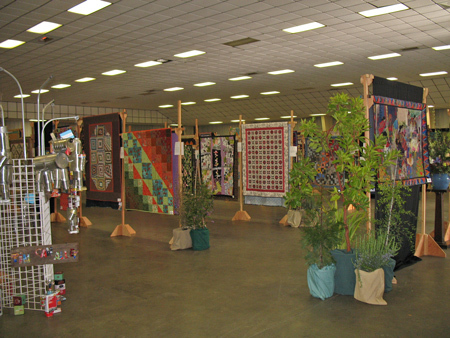 This weekend is my home guild’s 32nd annual quilt show. I look forward to it so much every year. I have a big smile on my face every minute of the weekend… can’t help it. This year I did my best to capture a photo essay of the stages, from nothing to everything to nothing again. It’s quite a miracle what happens. 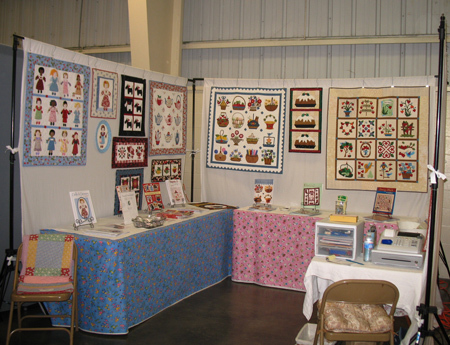 Well, if a miracle can be due to the hard work and step-uppitty-ness of a whole lot of quilters, their spouses, their kids, and their grandkids. What a community. 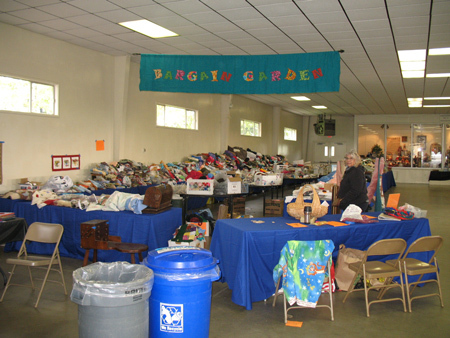 Laura, our BG coordinator, collects donations all year. 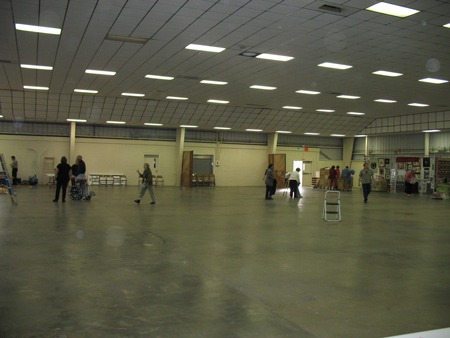 She sells at every meeting but despite that, our storage locker was jam packed and so was Iris’s garage! Before the first load arrived. After we got things kinda sorta sorted from the garage delivery, then the truck from the storage locker arrived. Holy cow. 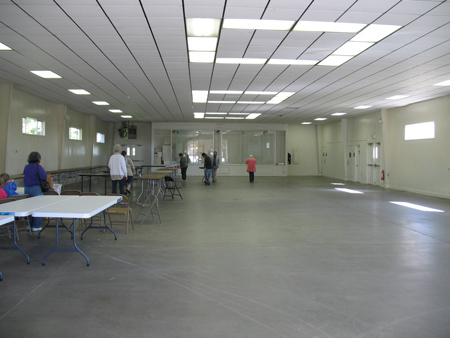 Another building at the fair grounds, where lunch, quilts, vendors, and the stage for the fashion show and live auction will be. 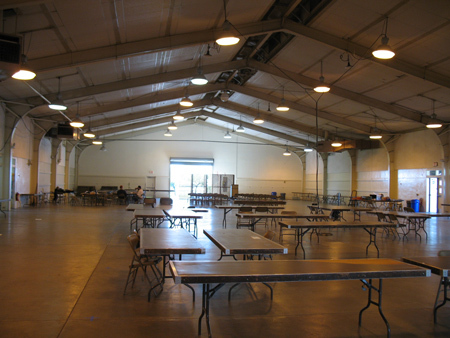 The main exhibit hall, getting ready for intake and setup. 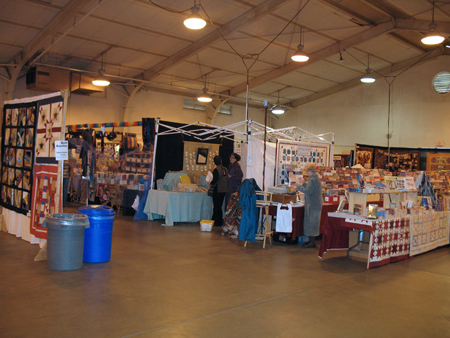 My booth location is to the right side, near the front. 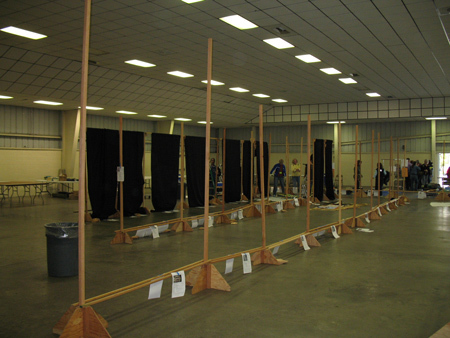 The racks are up and the layout is mapped. The menfolk like to come and help because they get to climb on ladders and use power tools. 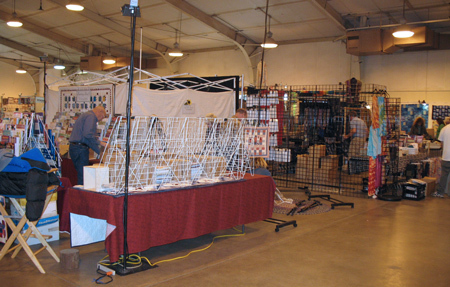 Yes, that's right, these racks are assembled and disassembled every year. 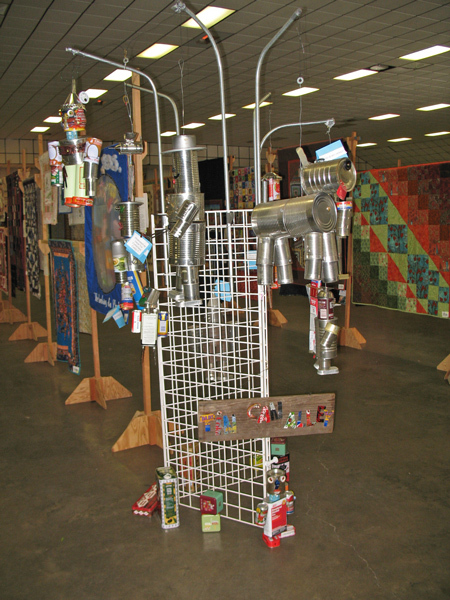 This year the show chairs charged a special assessment to purchase backdrops for the show. Not sure yet how they're looking. 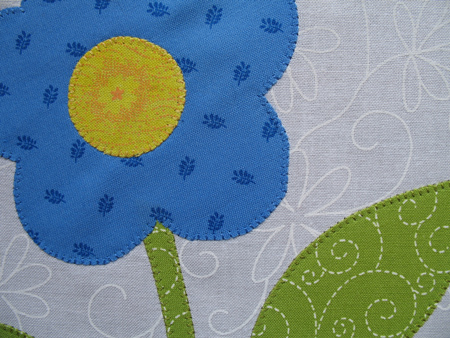 Kim Jamieson-Hirst of Chatterbox Quilts is a designer friend of mine in Calgary. 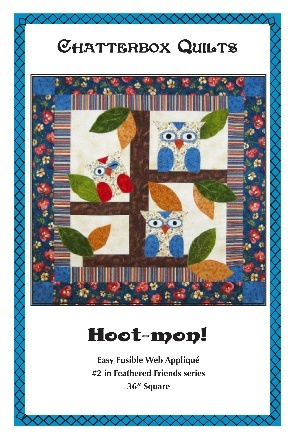 Recently, she put out the most darling pattern called Hoot-mon! I love this perky little family of owls. “Hoot-mon,” according to the urban dictionary, is Scottish for “Yo dude!” That makes me laugh. My grandmother was Scottish, however I don’t remember her using this expression. I guess she just wasn’t that hip. It does convey to me the sense of Canada being part of the Commonwealth. And how’s this for cute? We’re giving away a copy of Hoot-mon! to a lucky winner, so leave a comment by 7:00 p.m. California time on Monday, February 22, to enter the draw. Tell us why you like owls! 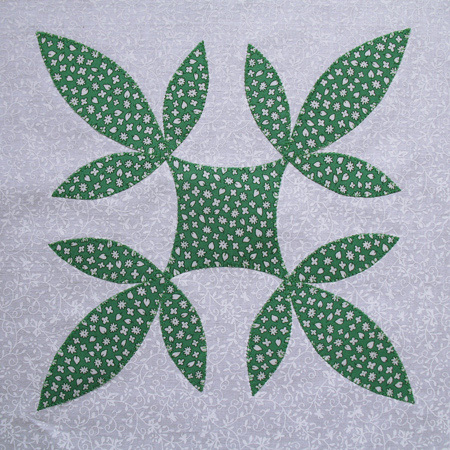 Coming up on the blog… revisiting thread topics and a look at Tile Quilt Revival. Even though this is the ninth time, it’s still so exciting when I get that call to come pick up cartons of new books, hot off the presses. Dolls & Dresses to Appliqué is officially in print! 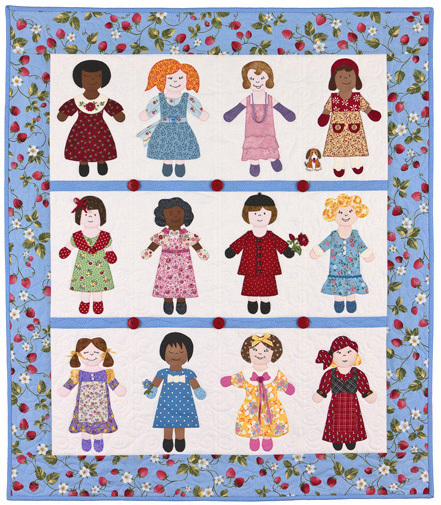 There are a dozen dolls and cute dresses, plus instructions for a sampler quilt to show off the entire collection. 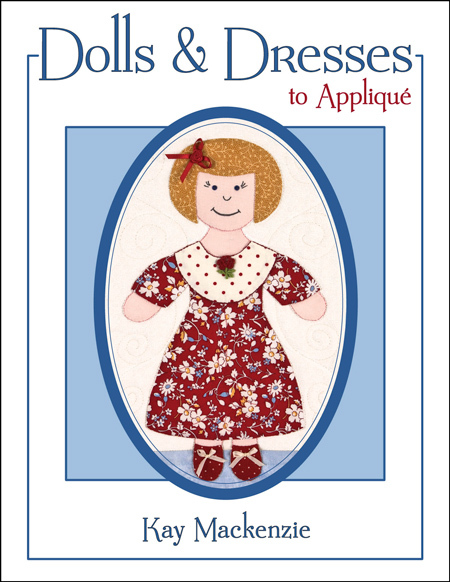 Dolls & Dresses is available at By Kay Mackenzie. As my Valentine for you, gentle readers, I created a coupon just for readers of this blog and my newsletter (but feel free to tell your friends). If you’d like to appliqué some dolls, or order anything else from the website, put 2OFF in the coupon code area of the shopping cart and you’ll save $2 bucks off your next order! Coupon expires 12/31/10. 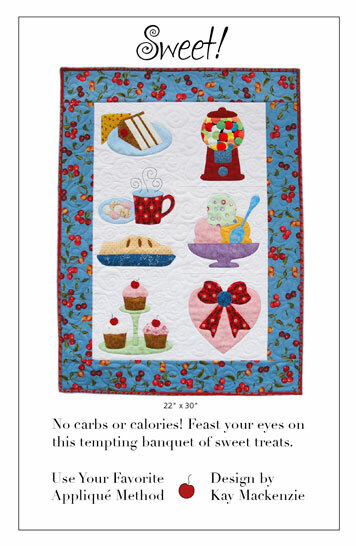 Plus, the current company special is a free copy of Home: A Heartfelt Nap Quilt with any book order. Such a deal! Oh yeah… as if pushing out a new book from my company and working on a new book for Martingale weren’t enough, I decided to put out a new pattern too. Meet Sweet! 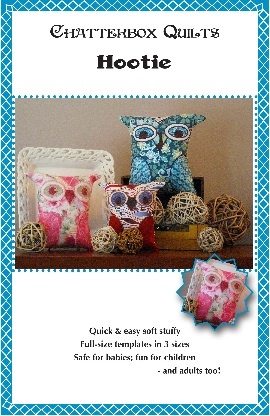 Available on the Patterns page at the website. 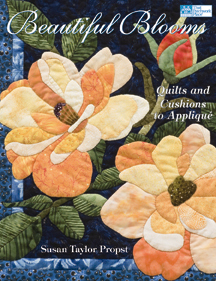 This month’s book review is the brand-new title from Susan Taylor Propst, Another Season of Beautiful Blooms: Appliquéd Quilts and Cushions. Inspired by the gardens and countryside of England and Europe, this book brings fresh floral designs to appliqué enthusiasts. 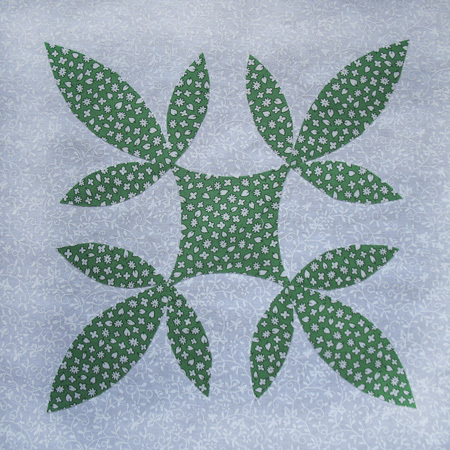 Each of nine flower designs includes a full-sized block pattern and instructions for both a pillow and a wall hanging—in two different colorways—providing 18 projects in all. 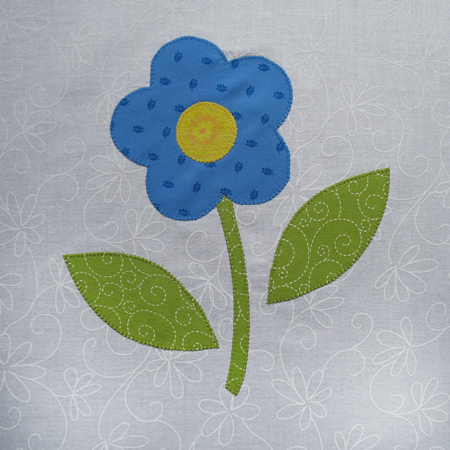 In the intro Susan says, “These designs are great for hand appliqué, but can also be done with fusible appliqué. 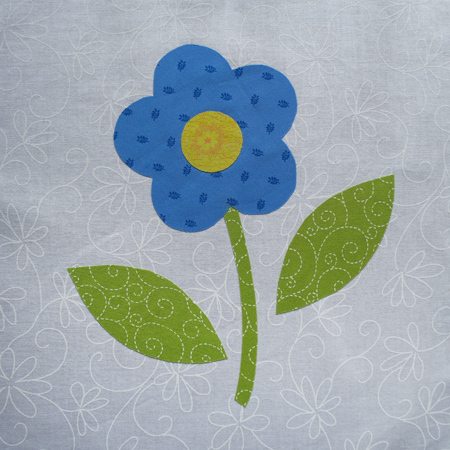 One of the best things about appliqué, and flowers in particular, is that the result doesn’t have to look exactly like the pattern. 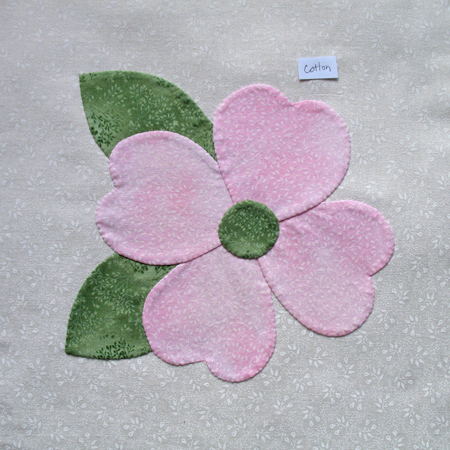 Flowers are quite varied, so relax and enjoy the appliqué.” Here here! This gorgeous book is filled with photos of the cultivated gardens and wild countryside that give the author inspiration. 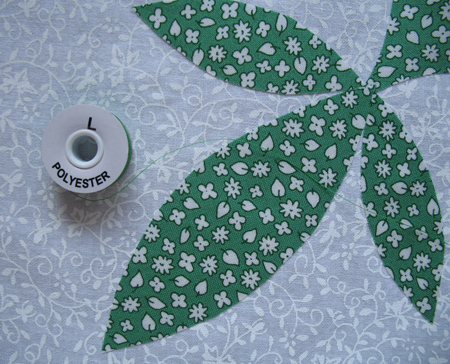 The front matter includes information on choosing appliqué fabrics, backgrounds, and borders, then moves to the appliqué process. 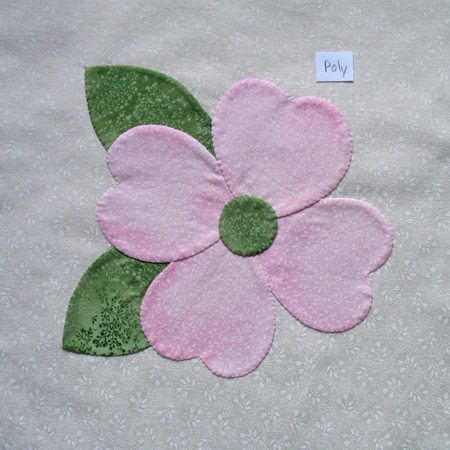 Susan uses the overlay method for positioning, and uses freezer-paper templates on the back of the appliqué fabrics. Step-by-step instructions and illustrations take you through her process in detail. Unit appliqué and bias stems are also covered. 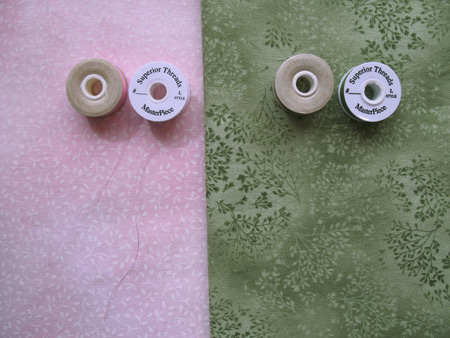 Then there are some really great general instructions for making wall quilts and cushions. On to the flowers! So beautiful. 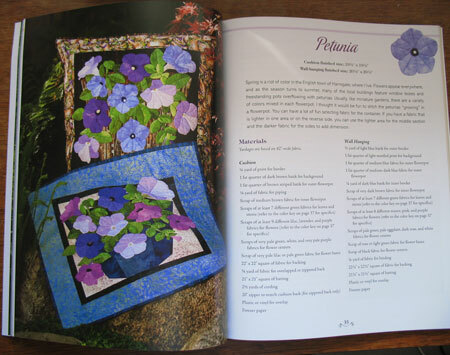 Petunias (as seen on the cover), Poinsettias, Black-Eyed Susans, Cherry Blossoms, Lilies, Tuplis, Bougainvillea, and more! 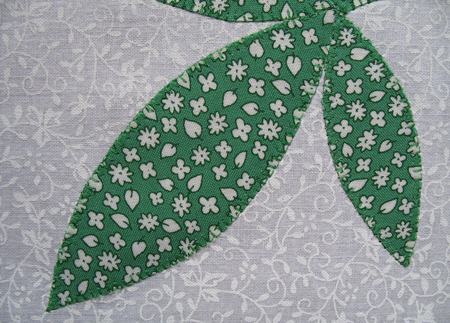 Each one detailed and realistic, yet designed to avoid difficult stitching. 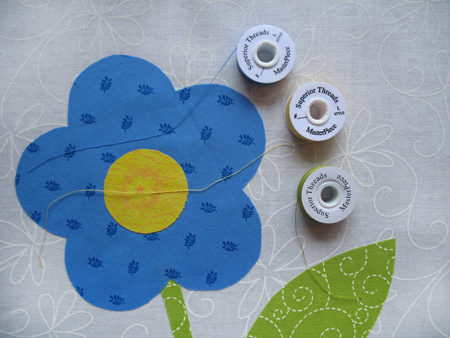 If you like floral appliqué, you will love this new book. Martingale and Company has provided a copy for a drawing, so leave a comment before 7:00 p.m. on Friday, February 5, to be eligible to win. And guess what? 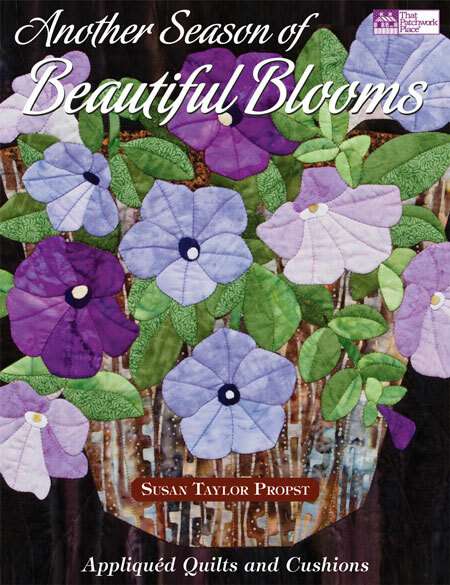 I also have Susan’s first book in the series, Beautiful Blooms! The lucky winner will get both books! That’s a whole lotta floral appliqué. U.S. and Canada only, unless you’d be willing to pay the shipping. A note to those subscribed to the blog by email: To leave a comment, you’ll first need to click over to the blog itself. Scroll to the bottom of the post and click on the Comments link. Leave your comment there to enter the drawing.